The Hartmann door access control system includes the door controller, door readers, and access control management software. The controller connects to the network and is powered using PoE. It supports a single reader or back-to-back readers. Also available as a two-door system. The door controller connects to the network and is powered using PoE, making this very easy to install and expand. The door controller is mounted in an ABS enclosure. It is designed to be mounted above the secure side of the door. It has an optional built-in PIR sensor that can be used as the Request to Exit. A very flexible controller that can mount on top of the door and provide a built-in motion detection function. Each door controller supports up to two readers. You can select inside and outside readers, with or without motion detection, or two separate door control. Operates even if the network is down (as long as the controller has power). The same controller modules can be ganged together inside a central control box that can be used to retrofit older door access control systems. The controller provides power for the electric lock. Includes an optional built-in motion detector that can provide the Request to Exit (REX) function. The controller can control two readers (inside and outside the door) or two separate doors. 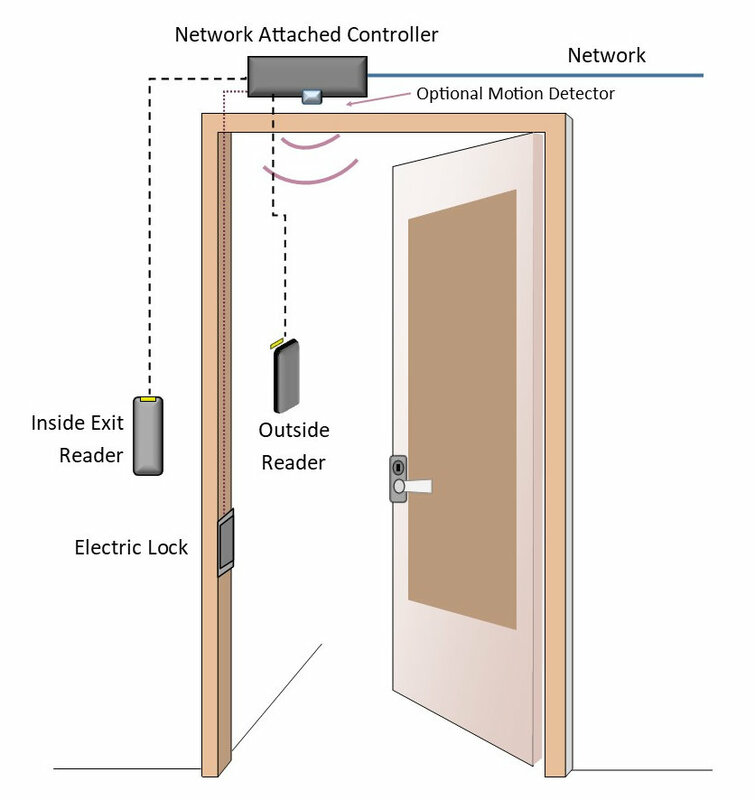 The following diagram shows an example of the devices that can be attached to the door access controller. The controller attaches to the network and is powered over Ethernet (PoE). The controller provides optional connections to all the devices required to provide complete door access control. The built-in relays control the lock and provide the capability to support two readers. Many different door readers are available. You can select, RFID proximity readers which include 125 KHz versions, HID compatible readers, Smart Card readers, biometric readers, and Bluetooth connected Smartphone credentials. The following diagram shows an example of how all the access controllers are attached to the network. All the controllers connect to a PoE type network switch. 4 x Fully configurable Inputs including supervised or digital input setting, includes door contact, exit button, external request to exit motion, etc. Wire Gauge/Type: 2-conductor stranded 22 AWG, Shield: Recommended, Length: up to 152 m or 500 ft.
2 x Solid State Relay (TVS circuit limits 24V), 1A limit.Wire Gauge/Type: 2-conductor stranded 18 AWG, Length: up to 152 m or 500 ft. There are many different door access readers that can be used with the access controller. The models support standard RFID 125KHz credentials or the new 13.56MHz Mifare smartcard format. The 125KHz readers support either proprietary format 125KHz prox credentials (that costs less) or an HID prox card format. The HID format is branded by HID and costs more. The HID type readers are usually used when the organization already has HID type credentials. You can also select the door reader that supports smartphone credentials, and connect over Bluetooth. The door access control software allows you to control a very large number of doors and the people that use them. It provides advanced functions such as logic if-then functions, and allows you to control elevators, visitors, and integrates with IP camera systems. Even though the door access management software provides advanced features, it is very easy to use and intuitive. The management software can be installed at your site or from a cloud server. It uses a browser window that’s compatible across all platforms from desktop to mobile. Easy Video integration into many video management software systems (VMS). The system integrates with many IP video recording systems. This includes many Video Management Software (VMS and Network Video Recorders (NVR). The video from multiple cameras is displayed in the same web browser as your door access management software. The real-time video can be displayed based on pre-defined alerts from the door access control system. The alerts include “Door Held Opened,” Door Forced Open, and many more. Examples of IP camera system systems supported include Milestone xProtect, ViconNet, Exact, Digital Watchdog, and some Hikvision NVR systems. You can create different viewing matrixes so that you can view many different cameras at the same time. Easy playback of the recorded video allows you to select a time period and verify any security concerns. Cameras can be viewed on all platforms including desktop and mobile devices. The Hartmann Door Access Management Software provides easy control of elevator floor access. An elevator access control unit is used to determine the floors that can be reached based on the door access control credential. For example, all the accountants who work on the 5th floor can reach that floor, but not be able to go to the IT department on the 3rd floor. Floors that contain general areas such as cafeteria or fitness center, would typically be available to everyone. The system can also be programmed to allow certain people, such as the executives to go to any floor. Reports are available to track users, door activity, elevator floors, administration usage, and more. The kit includes a Single Door POE Controller and multi-credential reader with integrated PIR / REX in a black enclosure. The reader supports proprietary 125KHz RFID credentials. Includes the RF120P proximity reader. The reader supports HID card credential, (125KHz). Includes RF200H RFID credential reader. Single Door POE Controller in a black enclosure. (* – opt. white enclosure). Includes the RF223H RFID credential reader with keypad. Supports HID card credential, (125KHz). Door Controllers Without the Readers. These controllers can be used with many different types of door readers. You can select from several types of Wiegand type readers that connect to these controllers. For more details, please contact us at 800-431-1658 in the USA, or at 914-944-3425 everywhere else, or use our contact form.